The world is sitting at the edge of a massive deflationary cliff. Even though Central Banks are desperately trying to keep the world's financial assets from plunging down into the great depression below, signs suggest they are losing the battle. Hugo Salinas Price explains in the article, "that the increases of International Reserves take place when the Reserve Currency issuing countries effect payments to the rest of the world." Basically, countries such as the United States that run trade deficits, exchange fiat money or Treasuries for goods from other countries. This shows up as an increase in International Reserves. Now, what is important to understand about the chart above is the timing of the PEAK & DECLINE of International Reserves. I had an email exchange with Mr. Salinas on what I believe was the leading factor in why the International Reserves peaked and declined. 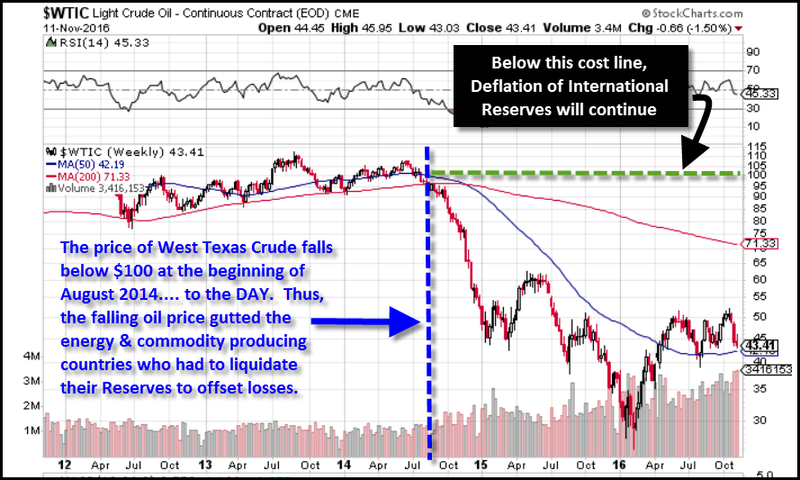 The price of a barrel of West Texas Crude fell below $100 starting at the beginning of August, 2014.... TO THE DATE. Even though the oil price had traded between $85-$100 over the past three years, it averaged over $95. However, by the end of 2014, it had fallen by more than half. This had a profound impact on International Reserves as the low oil price gutted the energy-commodity-goods producing countries. These are the countries that hold the majority of International Reserves. So, as the price of oil continued to stay below $50 a barrel, these countries had to sell Bonds and acquire cash to fund their own domestic account deficits. Thus, the peak and decline of International Reserves occurred right at the same time, the peak and decline of high oil prices. THIS IS NO COINCIDENCE. 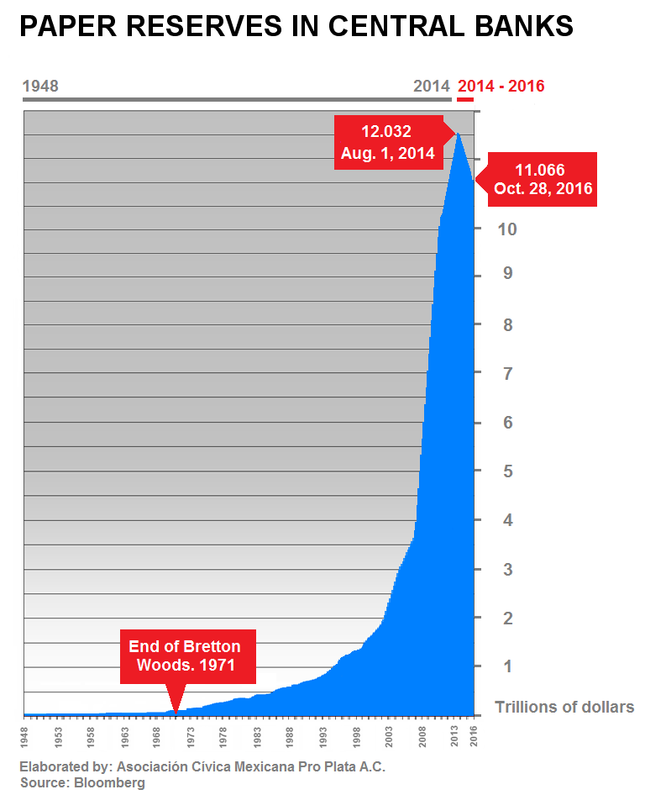 The reason for the massive increase in U.S. debt shown in the chart above was due to the falling EROI - Energy Returned On Investment of U.S. Oil & Gas. When the United States enjoyed an EROI of 30+/1 (prior to 1971), its debt remained low... relatively speaking. 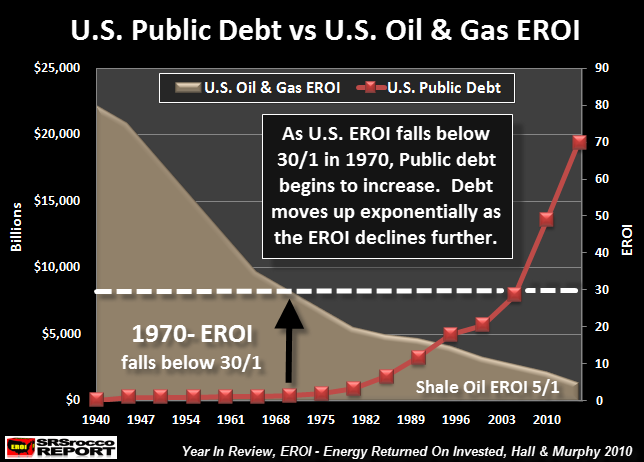 However, as the U.S. Oil & Gas EROI continued to decline, its public debt skyrocketed. Part of this U.S. debt is included as International Reserves. Basically, the United States (and other countries) could no longer afford to sustain their domestic economies with their own energy sources, so they had to import energy (commodities-goods) to continue business as usual. These trade or account deficits resulted in the exponential increase of International Reserves. Unfortunately, the peak and decline of International Reserves represents the POPPING OF THE MASSIVE INFLATIONARY ASSET BUBBLE. This is due to the falling oil price as well as the rapidly declining net energy in a barrel of oil. Mr. Salinas is one of the few spokesmen in the precious metals community that understands the dire implications of the declining global oil industry. He translated my Big Trouble At ExxonMobil article in Spanish on his website: Toca a su fin la época de la gran industria petrolera americana. ExxonMobil tiene enormes problemas. While the Mainstream media is completely clueless to the disaster currently taking place in the Global Oil Industry, most in the precious community are oblivious as well. This is due to the fact that most analysts in the precious metals community have BLINDERS on. They just rather focus on the direct impact of gold and silver, and nothing else. This is quite a shame as ENERGY is the KEY. Lastly, there seems to be a lot of discontent in the precious metals community since the price of gold and silver declined after the Trump Presidential election. Not only was the election of Trump as the U.S. President a surprise to most, the negative market reaction on the precious metals prices was the opposite of what most anticipated. That being said, I am not surprised to see that the many people have become disillusioned or distraught on falling gold and silver prices. This is the FICKLE NATURE of the general public or the typical investor. Few have the mental or intestinal fortitude to withstand going against the grain (mob). A perfect example of this was shown in the movie, THE BIG SHORT. The original investor (played by Christian Bale in the movie) had severe threats against him from his investors when it seemed as if the MBS Short trade was going against him. Ultimately, the Big Short trade against Mortgage Back Securities paid handsomely. On the other hand, the falling gold and silver price has not impacted me at all. The reason for that is my understanding of the Oil and Energy Industries. Again, most people in the precious metals community still don't understand the dire ramifications of the collapsing global oil industry, so they continue to focus on the GOLD & SILVER PRICE. This can be quite frustrating. So, if you are a gold and silver investor and want to continue to be frustrated by the paper price of the metals, please continue what you are doing. However, if you want to understand why the precious metals will be one of the only safe havens in the future, please learn more about the energy situation which I will provide in future articles.